Even if Jerry really does have the hottest pants in all the land, I’d hesitate before handing over my retirement savings. Something as simple an email address makes a big impact on how people perceive your business. Since a free email address promotes yahoo or gmail instead of your custom domain, customers aren’t likely to take your company seriously. If you haven’t invested in a professional email address, it looks like you don’t take your own company seriously either. Put a well-dressed foot forward with a professional email address paired with your domain name to establish trust and grow your business at the same time. Hotpants runs a real business, but who would know? When a professional email address is linked to a real website, customers can see that your company exists outside of the inbox. This leads to more trust that your email contains value, and a better chance of a clicked link that points back to your website. When customers head to your website in trust they shop with trust, which makes them more likely to purchase from you. If Hotpants sent me an email with a From Name such as ‘Jerry@retireearly.com’ instead, then I’d be interested. Not only do I recognize the website he’s connected with, the email handle also reminds me how his company proposes to help me. 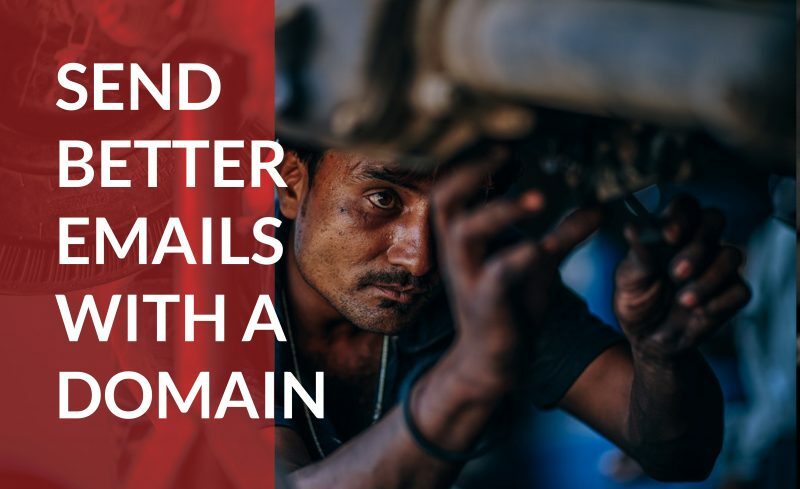 A Hotmail or Yahoo email handle does nothing to build a connection back to your brand in the eyes of a customer. When your email pops up in their inbox, the From Name helps you lead with your own brand name, not the name of a common internet company. With a professional email address, every email you send and every time your email appears on a business card, speaking credit, or flyer, your customers are seeing an advertisement for your brand. As your audience becomes accustomed to seeing your name, you stay top of mind. This means the next time they think of their problem, your products will come to mind as the solution before your competitors. When your email address is full of letters and symbols your audience’s inbox becomes harder to reach. The inbox of your potential customer is designed to reject incoming emails that look suspicious or at least send them to the spam folder. That means emails sent without a professional email handle may not even be reaching your customers. Since email marketing is so powerful, getting your emails to the inbox and opened is an important priority. Customers that signed up to your email list have shown their interest in hearing from you, and may even need to hear from you if it concerns their recently purchased products. Using a professional email address will make sure your business is communicating loud and clear. Your email address may seem like a small, insignificant detail that matters little to your customers. Even these small details can make a big impression, however, as looking like a professional is about the total package, not just a single aspect of your online brand. Using a personal email account when talking to your customers makes them think that you’re holding back from your business, and them, as if you’re not going to be fully committed to helping solve their problem. Instead of letting your customer’s imagination run wild, it’s much simpler to add a G Suite for Business account to your marketing tool belt. For a few dollars a month you can legitimize your email address, and also better collaborate with your team on spreadsheets, documents, or presentations, all stored in the Google cloud. Even if jerryhotpants@yahoo.com is the smartest financial planner around, customers would need a lot of convincing before handing over their hard-earned savings. Instead of looking like a novice, lead with a professional email that establishes trust in your business and connects back to your website.